The Koala and I had friends over for a sliders party last weekend. We love home made burgers and make them all the time. With The Koala as captain and me as his prep chef, we usually create towering cheeseburgers with all the trimmings that require you to unhinge your jaw to feast upon. Having a burger party was on my foodie bucket list. 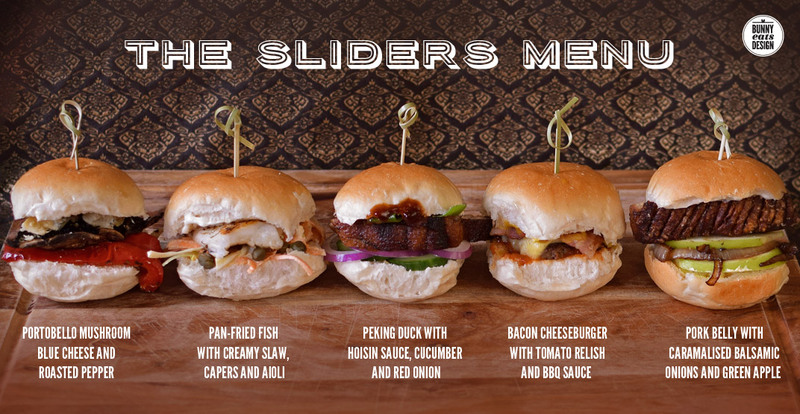 Having never made sliders before, we might have been too ambitious with our five slider menu. Luckily we didn’t have many guests and everything went smoothly (if a little frantic). We made 50 sliders but this was too many as the sliders were more filling than anticipated. Our eyes were much bigger than our stomachs so we sent everyone home with extras and we grazed on leftover sliders all night. All the sliders were good, some were just better. In future, I would just make the top three flavours. Five kinds was too much work for our little kitchen. Here’s a quick guide to the sliders we made. Makes 8. Preheat oven to 180°C. Brush clean 2 large portobello mushrooms, spray each with cooking oil, season with salt and pepper and sprinkle with tarragon. Wash, deseed and quarter 2 red peppers, drizzle with oil, and sprinkle with salt and pepper. Roast mushrooms (gill side up) and peppers for 20-30 minutes until cooked through. Top mushrooms with pieces of blue cheese. Return to oven and bake until cheese is melted (10 mins). Cut each mushroom into quarters. Halve 8 slider buns and spread with butter and mayo. 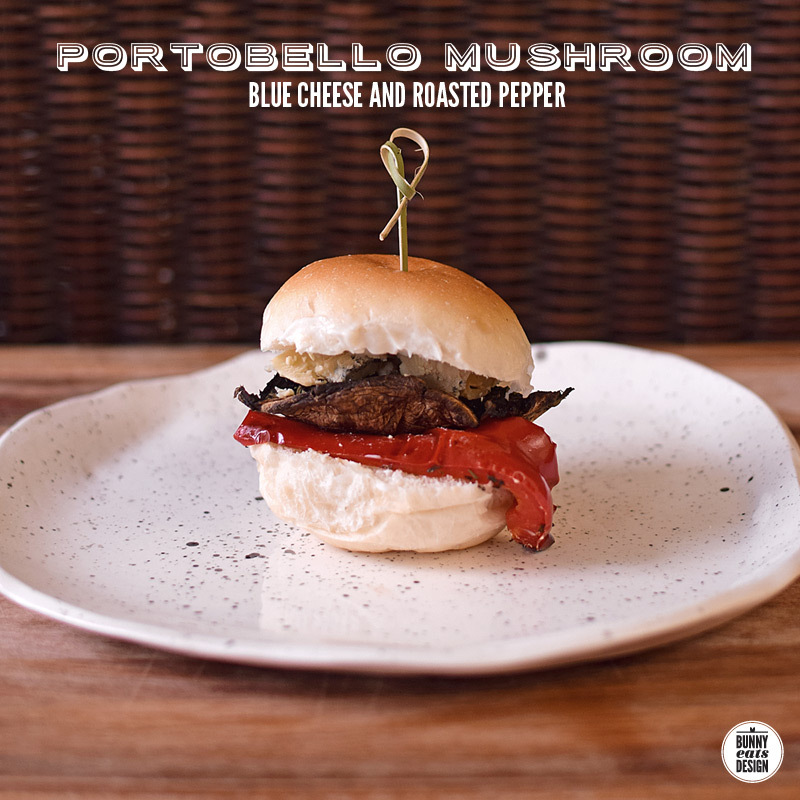 Place a piece of roast pepper on each slider bun, top with piece of mushroom and cover with top bun. Makes 10. Cut 500g (17oz) fish fillets into 10 pieces. Sprinkle with dried herb, salt and pepper. Heat a knob of butter in a pan and fry fish both sides until cooked through. Halve 10 slider buns and spread with butter and aioli. Put half a cup of shredded cabbage and half a cup of grated carrot in a bowl. Add 1 tablespoon white vinegar and 1-2 tablespoons creamy mayonnaise. Add salt and pepper to taste. Mix. Place a some slaw on each slider bun, top with 4 capers. 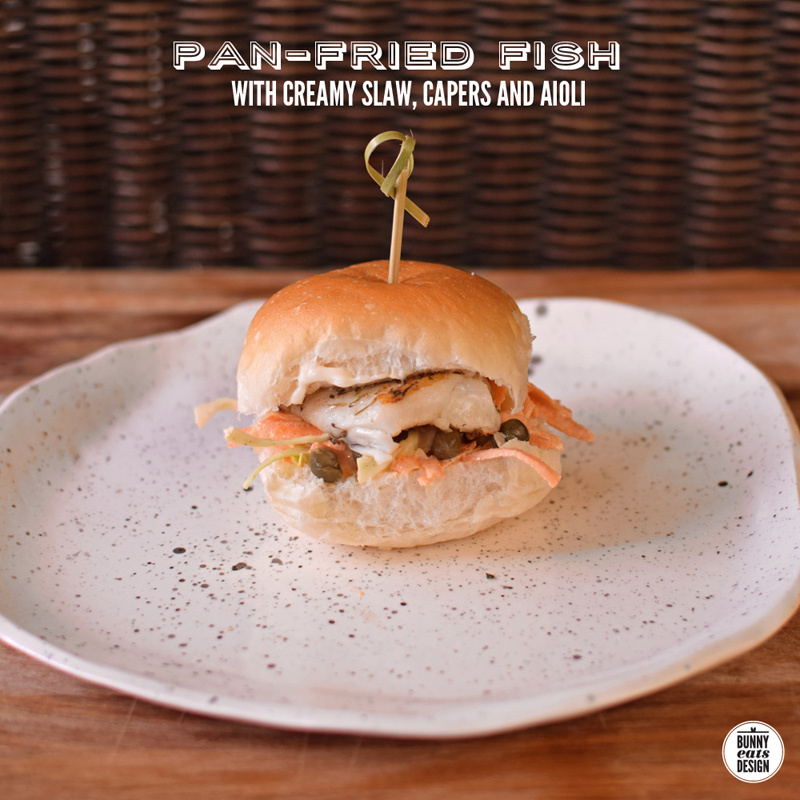 Add cooked fish to sliders and cover with top bun. Makes 10. Cook 2 duck breasts (440g / 15oz) according my duck recipe here. Once cooked, each duck breast into 5 slices. Halve 10 slider buns and spread with butter and hoisin sauce. Add 2 slices of cucumber and a few rings of red onion (optional: sliced spring onions). 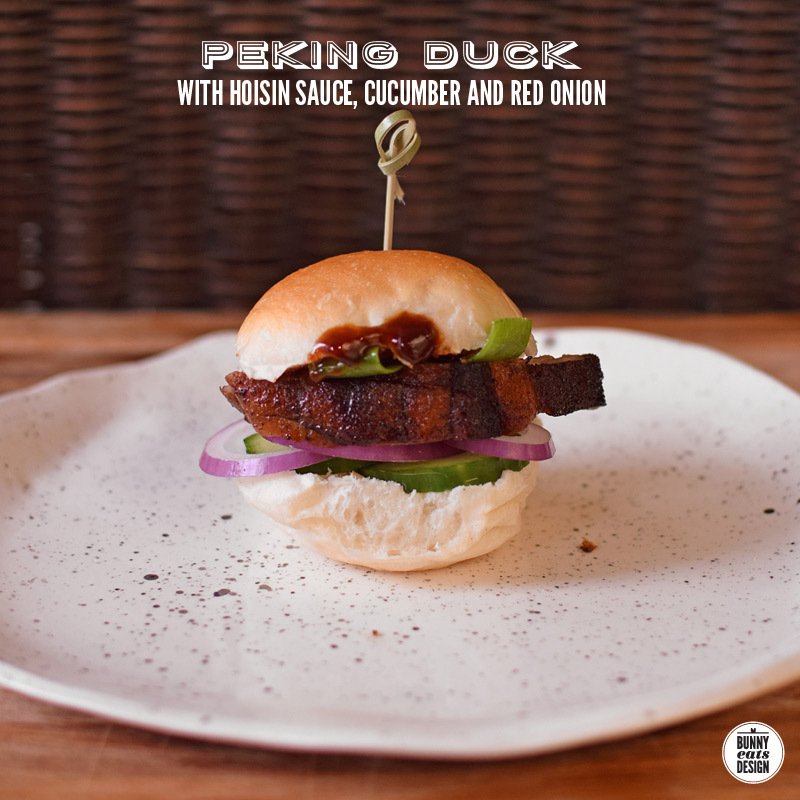 Add a slice of duck to each slider and cover with top bun. Makes 10. Take 500g (17oz) beef mince and make up into 10 patties using your favourite patty recipe. Fry both sides until cooked, top each patty with a slice of cheese and cover with lid and cook until melted. Halve 10 slider buns and spread with butter, relish, BBQ sauce and mustard if you like. Add half a pickle to each slider. 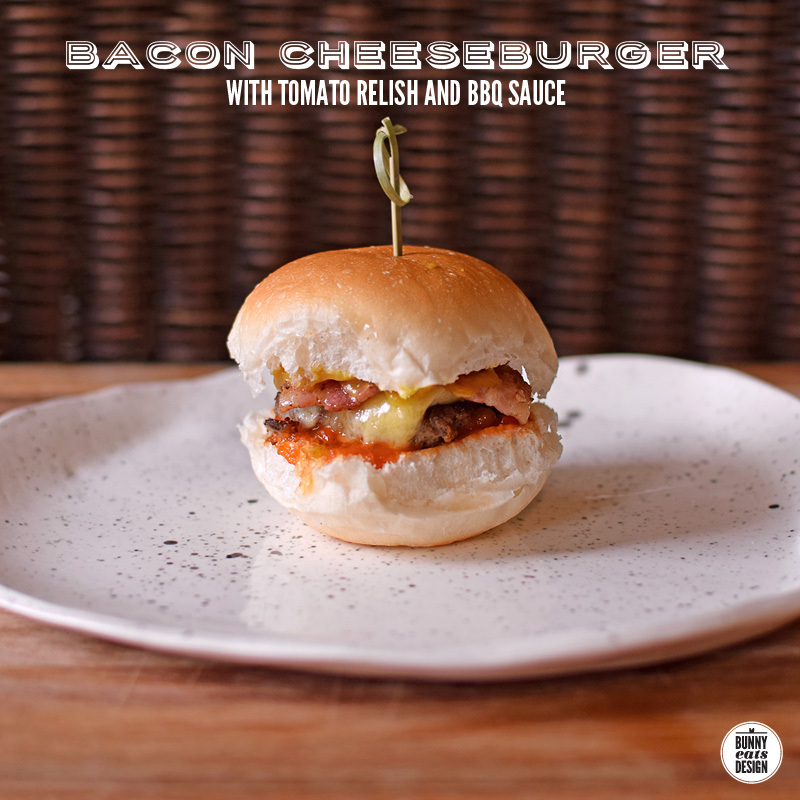 Add a cheese patty to each slider along with 2 small slices of cooked streaky bacon and cover with top bun. Makes 10. Cook 700g (25oz) pork belly according my recipe here. Cut the cooked pork belly into 10 equal slices. Halve 10 slider buns and spread with butter and plum sauce (optional). Peel and slice 1.5 onions, fry with a knob of butter and a shot of balsamic vinegar on low heat for 20 minutes until onions are gummy and delicious. Add some onions to each slider along with 2 slices of green apple. 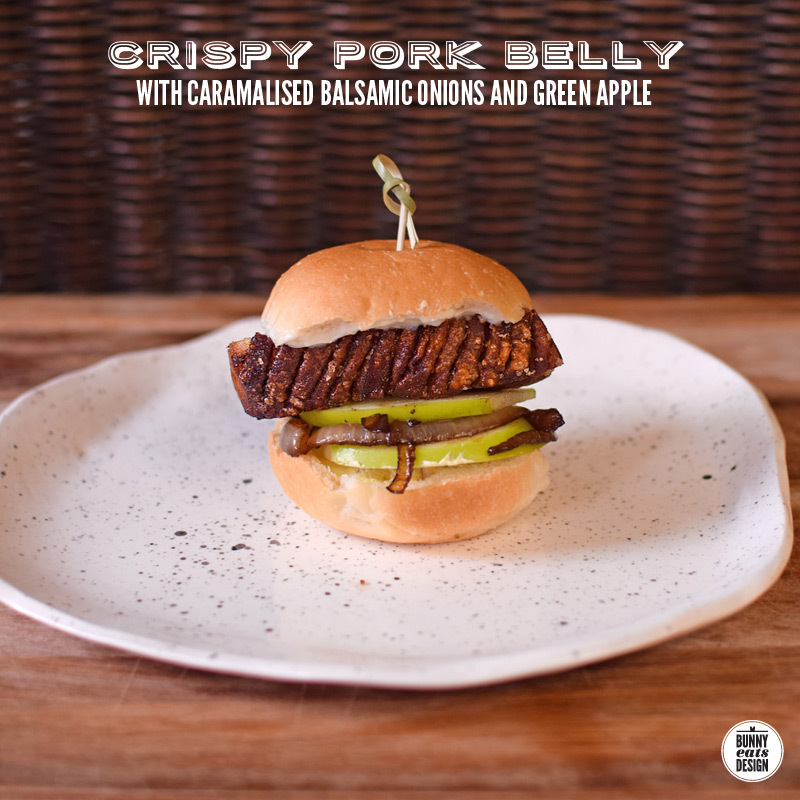 Top with a slice of crispy pork belly and cover with top bun. Make a list and have a game plan. Get all your prep done ahead of time. Prep can take longer than you expect. Set up a plate/board for each type of slider, add cut buns, sauces and spreads and and fill each slider up with everything except for the hot component. Add the final hot piece prior to serving. Allow 3-4 sliders per person. Meat patties, fish (and bacon) can be cooked to order (after guests have arrived). Duck, roast pork and roast vegetables (and bacon) can be cooked ahead of time and kept warm in the oven. There’s a lot of prep involved, I had my knives sharpened and this made prep a pleasure. Limit the menu to 2-3 kinds of sliders. Too many options can be confusing. Most people prefer to try one of each rather than have to choose. Order small dinner rolls from your local bakery (we went with Bakers Delight). Pick up day of party, nothing worse than stale buns or going to the store and realising they’re out of buns. Pin sliders with 10cm party picks. Don’t be mean with the sauce, but don’t use so much that the sliders are messy to eat. Do dishes as you go. There can be an crazy amount of dishes for each recipe and if you’re short on counter space, you’ll appreciate a clean(ish) kitchen. This post is part of Our Growing Edge, a monthly blogging event to encourage bloggers to try new food related things. Pia from Joie de Vivre and Cupcakes is the host for this month’s event and the theme is PARTY WITH FRIENDS. If you have a blog and you are eating or cooking something new this month, click below to join. More information here. What fun! These look amazing. I think I would love that pork belly one for sure. Oh yes, I would love to have a bao party too! They all look so amazingly delicious! These all look so good and I am definitely going to try this! YUMMMMM. Your blog is inspiring. I nominated you for a Dragon’s Loyalty Award. Thank you Joann, that is very kind of you. Mmm these all look amazing! I love sliders, for some reason I think everything tastes better in miniature. Wow wee Genie, you outdid yourself! How long were you up making these bad boys? I didn’t lose any sleep. Started prepping around 10am and we were almost done by the time our guests arrived around 1pm. That included making 1 of each for the photoshoot at 12noon. These all look amazing! Can’t wait to try! Ahh they look so cute sitting side by side. I’ll have the duck one thanks!! I’m so impressed with the number of different slider flavours you’ve made! I threw a slider party last year (an ode to Wellington on a Plate/Burger Wellington which I was missing for the first time) and did four types which was hard work enough! Probably didn’t help that I got a little too excited and invited 10 guests… I think we made close to 100 in total! These look amazing! Your prep was probably very organised having done that in just 3 hours… for 50 sliders… and with five kinds! Last summer we went to a sliders party, 5 couples and each were tasked to bring their specialty, I brought pulled pork with slaw on home made pretzel buns! Having friends bring sliders takes the pressure of the hosts and even though some of the folks weren’t cooks, they really got into it! Even 5 were way too many, three would have been perfect! Your sliders look amazing, although most of the buns are far too big for me, that’s why I hade my own, they were just perfect! I love the idea of a sliders potluck. Great idea. Your pretzel buns are amazing. Thanks Genie, it was really fun.